Encounter: Bugatti Veyron 16.4 Grand Sport Vitesse. The One to Appear in Tranformers 4: Age of Extinction. This past weekend here in Chicago was a very active weekend around the shoot of the upcoming Hollywood blockbuster movie Transformers 4: Age of Extinction. As it is now a common thing, our Audemars Piguet Royal Oak Offshore Diver a.k.a. the 'fancy car magnet' attracted this amazing car while we were cruising around the lower-lower level of Wacker Drive. The only thing we could've wished for is that the whole car had been uncovered. 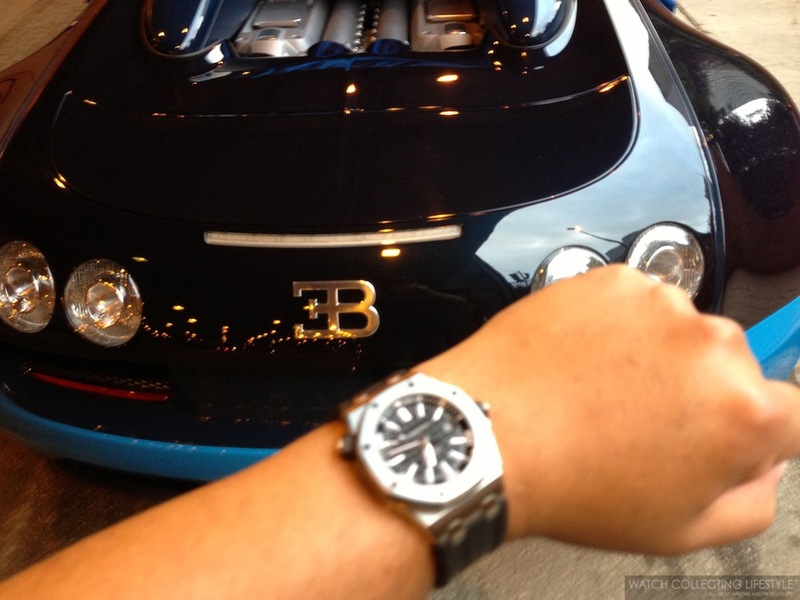 Watchlifestylers, meet the Bugatti Veyron 16.4 Grand Sport Vitesse in dark blue with lighter blue accents. This is the very same car that you will get to see in the movie next June 27, 2014. Paramount Pictures, thank you for bringing this beauty to our city! It was quite exhilarating to get this close to the most amazing automobile ever created in the history of mankind. We tried to get as close as possible; however, very tight security and police protection didn't allow us to take as many shots as we would've liked. Regardless, here are some spy shots for your viewing pleasure. This Bugatti Veyron 16.4 Grand Sport Vitesse is not only the most powerful but also the fastest roadster in the world. Fitted with a quad-turbocharged 8.0 liter 16-cylinder engine, this machine outputs an astounding 1,200 hp and reaches a top speed of 258 mph —granted that you have the clear plastic top on. This Bugatti is twenty percent more powerful than its predecessor the Grand Sport with a torque of 1,106 lbs/ft. and it is the most amazing automobile ever built and it will take you from 0 to 60 mph in mere 2.4 seconds. We wonder what the g-force would be with the pedal to the metal from full stop to 60 mph. If you are thinking of getting one of these amazing machines, you need to act fast because as you know, Bugatti’s self-imposed decree caps the production of the Grand Sport at 150 units. You know we hate stock images; however, since we couldn't get the full car, we have included a stock image at the bottom of the post so you can see the what the full car looks like. Sticker Price $2.4 Million USD. For more info on Bugatti click here. Posted on September 6, 2013 by Editor & Publisher and filed under Automobiles and tagged Bugatti Veyron Grand Sport Vitesse Bugatti Veyron Transformers 4 Audemars Piguet Royal Oak Offshore Diver Lower Lower Wacker Drive Chicago Filming Transformers 4 Age of Extinction Paramount Pictures.